Would you jump out of a plane without any knowledge, instruction or preparation? Not likely. In fact, you are required to take a short class before you skydive for the first time. Such instruction increases your safety while also giving you a greater feeling of security and well-being. I believe in pregnancy and childbirth all moms should take the time to prepare their mind. The wonderful thing about hypnosis is that it is easy and extremely relaxing! Often, we refer to it as a “Brain Massage” here in my office. Hypnosis for childbirth has gained a lot of attention in recent years and even has a celebrity following with the likes of Kate Middleton and Kim Kardashian reportedly using the techniques to make their experiences easier. When you say the word hypnosis, many people instantly think of people in a stage show being magically transformed to do things they would not otherwise do. But the truth is hypnosis is so much more than that, and carries many benefits throughout all stages of fertility and pregnancy. Hypnosis is used to help women to conceive and to cope with everything from morning sickness, pain, anxiety, fear. Hypnosis helps with the actual labor and delivery. Medical professionals have used hypnosis and self-hypnosis techniques since the 1930s to help expecting moms achieve physical comfort and deep relaxation. Hypnosis helps keep the mom to be in a more positive state of mind. All of these benefits AND MORE stem from the complete psychological shift you have when you practice hypnosis regularly. 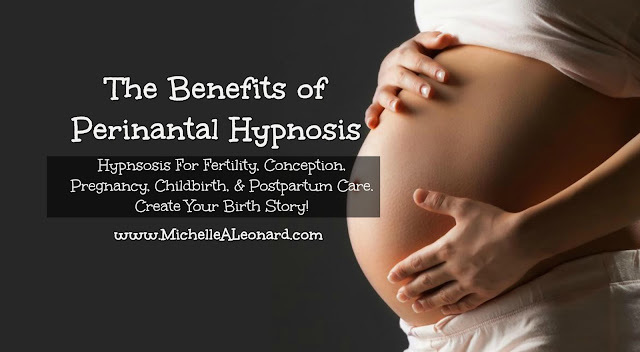 Perinatal (Fertility, Conception, Pregnancy, Childbirth, & Postpartum) Hypnosis should be done with a certified clinical hypnotist with a Doula background such as myself at Michelle A Leonard Hypnosis, and similar self-hypnosis techniques can also be used alone by the client. The process usually begins by having the client lie down. She then begins to take slow and even deep breathes for a few minutes. Through what feels like a guided meditation and with Neuro-linguistic programming techniques the client becomes fully relaxed. During this deep state I am then able to offer appropriate and personalized suggestions out loud pertaining to the goals. A few examples. Your stomach is calm and relaxed. You are calm, relaxed and feeling strong. Your baby is calm, relaxed and healthy. These are just some very basic most common suggestions that are made during hypnosis. During a session these examples are expanded upon and tailored to specifics. I then reinforce, tie together, the subconscious suggestions with physical actions. These physical actions combined with the suggestion forms an association, so even when the pregnant woman is not in an active state of hypnosis she, her partner, and or with her doula can trigger the subconscious suggestions with the simple physical touch or action that has been placed. The reason hypnosis works so well is because the conscious mind acts as a gatekeeper to the subconscious mind, and under hypnosis we can make the conscious mind quiet, allowing us access to the subconscious mind. This allows us to get deep into the part of the brain that deals with the reactions to stress, pain, fear, emotions and more. Hypnotherapy can reprogram your beliefs and instill positive thoughts that pregnancy and birth will be controllable, comfortable, easy and exciting. You can create your birth experience. In most cases, after the first session, most women are eager to get back to into a guided hypnotic state because it makes them feel better, extremely relaxed, more confident and relaxed about their pregnancy. Ideally you can start hypnosis in your first trimester. This gives you a chance to get familiar with hypnosis. Getting in tune with your body early in pregnancy will help you align better with the many changes your body will be going through. Early hypnosis practice will make it easier to relax and sleep better later in pregnancy when most expectant mothers have more difficulty finding comfortable sleeping positions. Many hypnobirthing mamas report how easily they would fall asleep at night if they listened to their personalized CDs or practiced self-hypnosis techniques just before bed. Ultimately, hypnosis is about positive mindset shift. It is about unschooling your brain from the negative and often traumatic images about pregnancy and childbirth that most of us have been brought up with. The subconscious mind is powerful and becomes imprinted with repetition. Every person I see as a client, a 100% of the time, has a constructive imprinted experience that positively impacts their entire life. Repetition of negative imagery about childbirth has made most of us visualize birth only as scary, frenetic and painful. Using repetition of positive imagery can reverse all of those negative thoughts and give you a fresh, new perception of birth. You can create your birth experience and long lasting beautiful memories. You, your pregnancy, your birth experience, and Your Baby are Worth It!